Irish singer-songwriter Glen Hansard talks to Q about the more upbeat sound he has discovered and what he really thinks about the musical Once, based on his collaboration with Czech singer Marketa Irglova. 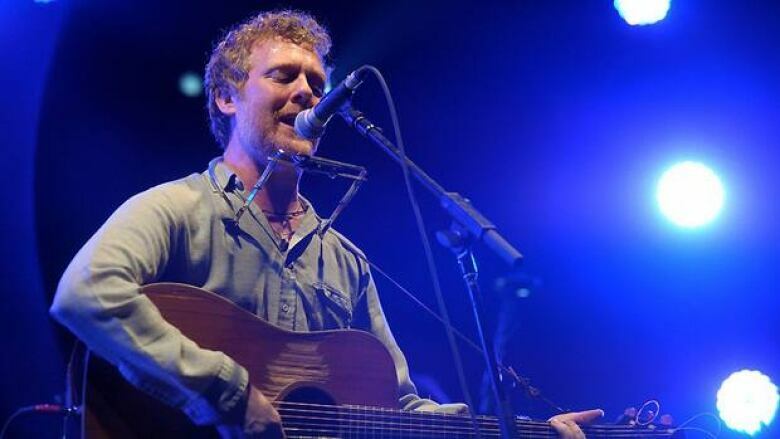 Irish singer-songwriter Glen Hansard wants his fans to get used to a more upbeat sound that he's just discovering. The former busker who shot to international fame with the indie film Once, made with Czech singer multi-instrumentalist Marketa Irglova, is going solo with his newest album, Rhythm and Repose, to be released Tuesday. Hansard who previously recorded with his band, The Frames, had an acting role in the 1991 film The Commitments and did three albums with Irglova and their band The Swell Season. They won an Academy Award for the song Falling Slowly from Once. Hansard is known for the melancholy sound of the very popular Once soundtrack. In an interview with Jian Ghomeshi, host of CBC’s Q cultural affairs show, Hansard talks about the difficulty he had adjusting to relative fame after 20 years struggling to survive in music. He said he needed some quiet time to process the changes. Fortunately, he found that time during a trip to Jamaica, where he said he "started to get excited about music again." Hansard talked to Q about why he never practices and confessed he seldom knows what he’ll sing until a minute before he goes on stage. He also discussed his reaction to the success of the Broadway musical Once, based on his music, which earned eight Tony Awards.